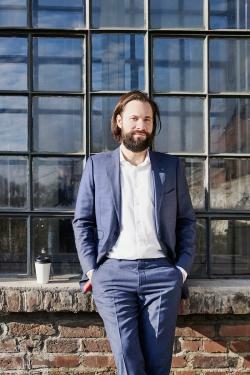 The term "casual cocktail attire" refers to a much more relaxed dress code for occasions that aren't considered formal or even semi-formal. For men, expectations can vary depending on the event in question. Whether you're heading to an informal wedding or an evening work function, the principles of what to wear to a casual cocktail affair remain the same. Simply put, this style of attire lies somewhere between cocktail and business casual. Avoid wearing a tuxedo or anything considered too dressy, otherwise, you might look out of place. 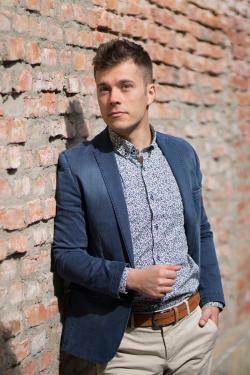 Deciding what to wear is easy once you know how, but don't get confused with semi-formal wear. There is a standard dress code for semi-formal or cocktail attire. This will generally consist of a light-colored suit for daytime events and a dark-hued suit for evening affairs. Regarding accessories, the suit is often combined with an Oxford shirt, dress shoes, and a complementary tie. Time of day - Choose bright colors and prints to suit daytime events, and then more muted tones and patterns for evening affairs. Weather - Summer attire is going to differ substantially from winter functions due to the necessity of layers. Opt for smart sweaters worn over a button-down shirt in a solid hue during cold temperatures or a linen jacket for when it heats up. 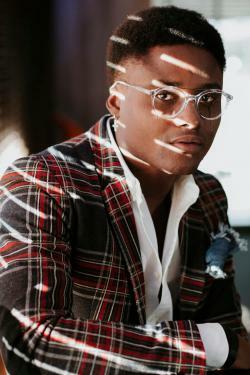 Seasonal trends - One way to be the talk of the event is to tap into the latest fashion trends. If you're heading to a summer wedding and stripes are a huge seasonal trend, grab a fresh-looking white and coral striped blazer and team it with coral-hued chinos to stand out for all the right reasons. There are many variations of men's casual cocktail wear that are comfortable yet stylish. Looking for the easiest option when it comes to casual cocktail attire? This aesthetic is super relaxed and simple. 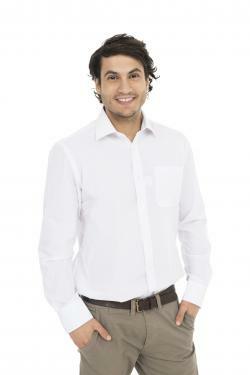 It consists of a plain, white, slim-fit tailored shirt and stone-colored slacks. Team this combo with a chocolate brown leather belt matching derby dress shoes to give it a dressy touch. For another straightforward yet chic look, opt for a plain white button-down shirt as before. This time, pair it with a two-piece suit in a solid hue. To put a fashionable stamp on the outfit, don't just stick to neutral shades when it comes to the suit. Instead, choose seasonal hues like mid-blue, forest green, or burgundy to add interest. Prefer an outfit that looks more youthful but still has a classic feel? Go with the same timeless white shirt but pair it with slim-leg chinos in an all-over bold hue, like blue or red. Play this combo down with a blazer jacket in a neutral color, like grey, beige, or white. For accessories, stick with a traditional leather belt and lace-up brogues for a cool and understated appearance. Add the fun factor to your outfit through a playful printed shirt like paisley or floral. Whether you mix and match your suit separates or stick to one hue, make sure they're neutral to let your shirt stand out and do the talking. To brighten up your look for the summer, opt for a tan leather belt and matching boat shoes. 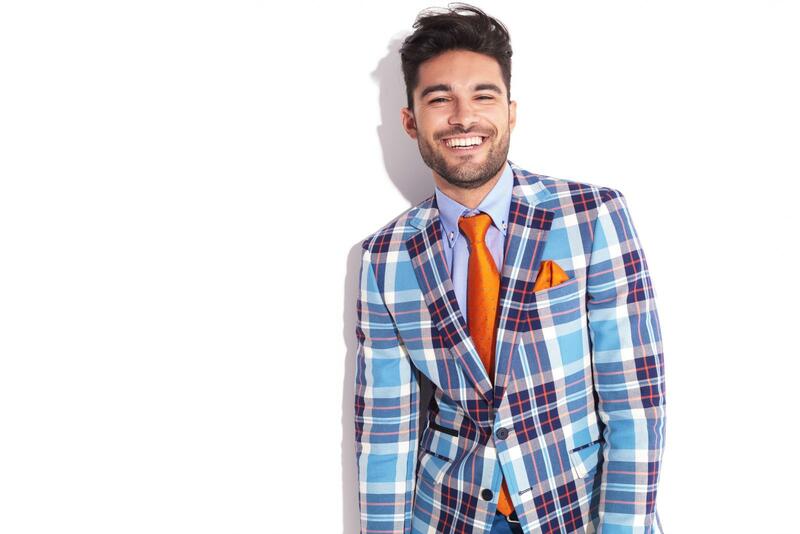 If you want an ensemble that's guaranteed to turn heads, choose a plaid suit jacket with a pocket square that picks up one of your jacket's hues. To avoid it looking too overpowering, complete your outfit with a neutral-hued shirt in one shade (like white, black, or grey) and neutral-hued chinos in another shade (like beige, tan, or stone). Don't forget to accessorize with a simple leather belt and monk strap shoes. For a cute and contemporary aesthetic, opt for a plain shirt with a blazer jacket in a seasonal color and a suit pant in a neutral hue. Tie the outfit together with a matching tie, pocket square, belt, and loafers for an elegant and refined look. Geek chic glasses are optional. The ideal fashion choice for a summer event consists of standout chinos in a bright or pastel hue paired with a complementary shirt and a neutral-colored blazer. In terms of footwear, choose a cool and breathable yet upmarket option like loafers or boat shoes. 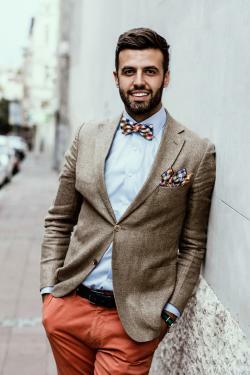 To put a quirky, modern spin on your outfit, finish it off with a printed bowtie and matching pocket square. Dressing in casual cocktail attire is trouble-free if you consider the timing, season, and specific occasion. Shop around and experiment with different variations until you find an option that works for you and your personal style.